Background: Endodontic sealers are designed to be used only within the root canal but are frequently extruded through the apical constriction and often placed in intimate contact with periapical tissues for extended periods of time. Hence, assessment of biocompatibility of endodontic sealers is critical to the clinical success of endodontic therapy. Materials and Methods: Eighteen Wistar rats were divided into three groups of 6 each for observation after completion of 14, 30 and 90 days following implantation, respectively. Polyethylene tubes filled with new sealer, and tube without sealer [control] were implanted subcutaneously. 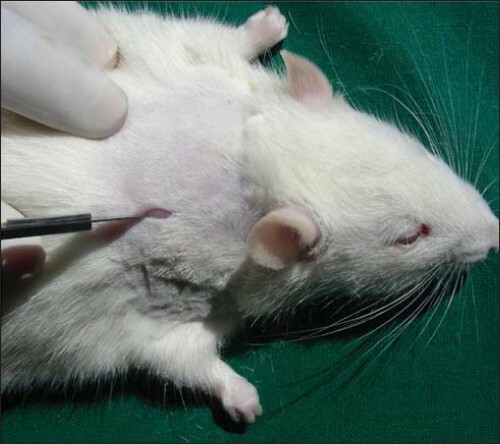 The sample subcutaneous tissues from sacrificed rats were analyzed histologically for inflammatory response and were graded with FDI criteria as minimal, moderate and severe. Results were analyzed statistically with Student's t-test and ANOVA tests. Results : Inflammatory reaction to the polyethylene tube was minimal at 14 and 90 days period and to the new sealer it was severe at 14 days and moderate at 30 and 90 days period. Conclusions: 1. Cytotoxicity of the individual ingredient of the new sealer should be investigated to find out its chemical reaction occurring at tissue interface resulting in persistence of inflammation. 2. This subcutaneous implantation method is a practical method for qualitative evaluation of endodontic material and can yield exact detailed information about tissue reaction of material on a cellular level. 3. Hence, animal study is positive, efficient and valuable method to carry out research successfully in dentistry. It is now appreciated that the sealer has a primary role in sealing the canal. A number of sealers have been formulated in the last several decades. Amongst the characteristics of the sealers used in obturation portrayed by Grossman,  the most important is that it should be biocompatible i.e. non-irritating to periapical tissue. The large variation in the toxicological and tissue-irritating properties of the materials studied by Brown and Friend, 1968; Spangberg, 1981,  seems to be not related with whether the tissue is irritated when it comes in contact with the sealer, but rather related with what degree and how long it is irritated and hence, it is necessary to evaluate the biocompatibility of these materials for a stipulated period of time. The methodology to evaluate the biocompatibility parameters comprises of initial tests, secondary tests and usage studies. 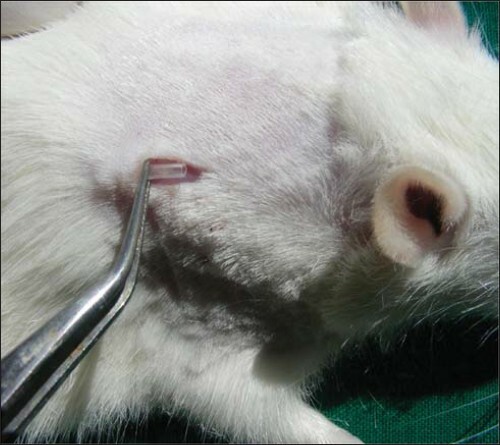 Subcutaneous implantation of an endodontic material into the connective tissue of rats has been recommended for evaluation of the biocompatibility and the tissue reaction of the material. Friend and Browne  concluded that the use of Teflon or polyethylene tubes filled with freshly mixed materials and implanted subcutaneously has greater resemblance to the clinical situation than any other methods. Resin based sealers have steadily gained popularity. The search for a biocompatible root canal sealer is constant. We have taken a new resin based sealer which has been manufactured by a Dental Company, India and has not yet been marketed. This sealer has not undergone any type of biocompatibility tests, which is necessary before its clinical use. The purpose of this study, hence, (?) 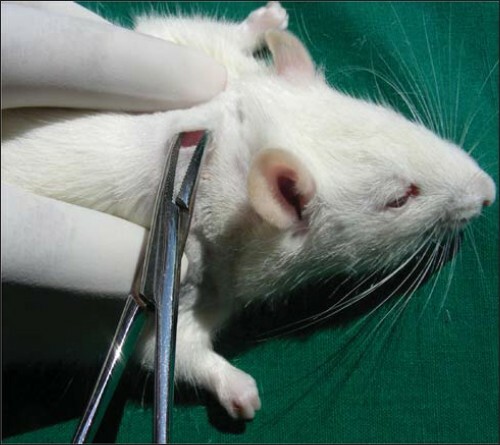 is to evaluate the biological tissue response of the sealers and to highlight the role of animal studies in dentistry by assessing the biocompatibility of sealers using subcutaneous implantation method in rats. The protocol of this study was approved and permission was taken from the Ethics Committee of Bharati Vidyapeeth University Medical College, Pune, formed as per rules and regulations of Committee for the Purpose of Control and Supervision of Experiments on Animals (i.e. CPCSEA). Eighteen Wistar rats weighing 150-200gm were divided into three groups of 6 each [Table 1]. In each animal, polyethylene tube was implanted subcutaneously at one side and the new sealer was implanted on the other side. Sterilized polyethylene tubes of 10 mm length with 1.4 mm inner and 1.6 mm outer diameters were used. These tubes were heat sealed at one end and the opposite end kept open so as to simulate the root canal, were used. The new sealer was mixed according to the manufacturer's instructions and filled in the tubes. Material smeared outside the tube was wiped off with sterile gauze. Empty polyethylene tubes (EPT) were used as a control. 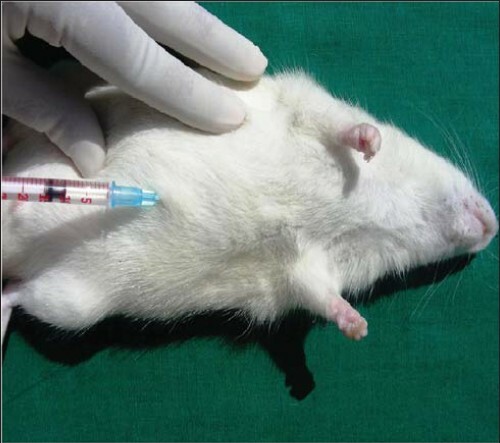 The rats were anesthetized [Figure 1] by an intra-peritoneal injection of Pentobarbitone sodium [30 mg per kg of body weight]. With aseptic precautions, an incision was made or incision was given [Figure 2] and two pre-prepared polyethylene tubes with the sealer or control tubes were implanted [Figure 3] in 15 mm long subcutaneous pockets [Figure 4]. These subcutaneous pockets were prepared at two different sites at the inter-scapular area. The two implantation sites were separated from each other by 20 mm to prevent interference from the other site. The animals were sacrificed on termination of the experimental periods viz. 14, 30 and 90 days. The skin including the subcutaneous tissues containing the implant was removed along with the surrounding tissue. The specimen was fixed with 10% formalin. After fixing, tissue was processed for paraffin embedding. A paraffin block was oriented in such a way that it was parallel to the long axis of the tube and serial sections of 5 - 6 μm were obtained. These were then stained with hematoxylin and eosin stains. Under 40X microscopic field, cell count was carried out on each section in ten grid fields by using an oculometer grid and results were expressed as average number of cells per grid field. Tissue response scores were subjected to statistical analysis. To verify its significance, Student's t-test and ANOVA test were applied. At the end of the14 day observation period, there was an infiltration of neutrophils, lymphocytes, few macrophages around the EPT. Scattered inflammatory cells were present along the side of the tube. New blood vessels and fibroblastic proliferation was observed which indicates formation of granulation tissue. The presence of few inflammatory cells, new blood vessels and fibroblastic proliferation indicates a mild inflammatory reaction [Table 2]. The presence of inflammatory cells i.e. neutrophils, eosinophils, lymphocytes, macrophages and foreign body giant cells were noted with the new sealer and the fibroblastic proliferation was not seen. Foreign body giant cells (F.B.G.) were observed with engulfed material. On comparing the control and new group, the average number of neutrophils, eosinophils, lymphocytes and macrophages differs significantly (P < 0.001) at open end, as well as at the sides of the tube and were on higher sides in new sealer. F.B.G. cells were present only around the new sealer. At the end of the 30 day observation period, the inflammatory reaction subsided in the EPT. Formation of a fibrous capsule had started and granulation tissue was becoming avascular. At the open end, some scattered lymphocytes and few macrophages were observed, but no foreign body giant cells were present. In the new sealer group, moderate inflammatory reaction persisted. Formation of avascular granulation tissue was not seen and there was persistence of F. B. G. Cells (in lower case), but neutrophils were absent. In comparison of the control and new sealer groups, the average number of lymphocytes and macrophages differ significantly and were more in the new sealer group at the open end and on the sides of the tube. Eosinophils and F.B.G. cells were present only around the new sealer. After the 90 day observation period, healing was complete in EPT with formation of a fibrous capsule. But in the new sealer group, persistence of chronic inflammatory cells infiltration was noted. Macrophages and F. B. G. cells were seen along with few lymphocytes at the open end, as well as at the sides of the tube. The formation of avascular granulation tissue and fibrous capsule was not seen. In comparison of control and new groups, the number of macrophages differs significantly (P < 0.001) at the open end and more so in the new sealer. The histopathological results are summarized in [Table 3]. In the present study, polyethylene tubes were used because of their suitability for maintaining the test materials in contact with the tissue in a controlled manner. , A small inner diameter of the tube was selected to minimize the flow of material out of the tube and yet allow loading of the sealer. The 10 mm of tube length was sufficiently long to have a control surface on the sides of the tube and the experimental surfaces of the sealer at the open end of tube. The study was done over an observation period of 14, 30 and 90 days. The 14 and 30 day periods were necessary to observe the initial response of the sealers and the 90 day period showed the presence of ongoing inflammation or the resolution of inflammation. In the present study, the inflammatory reaction was observed microscopically. In the present study, results were interpreted by preparing histological slides and grading was done based on F.D.I. Criteria  by counting neutrophils, lymphocytes, macrophages, foreign body giant cells, epithelial proliferation, vascularity and collagen fiber deposition. The present study demonstrated quick healing around the implanted polyethylene tubes by thin fibrous capsules. The reaction was minimal at 14 days, as well as at 30 days and showed complete healing at 90 days. Absence of any inflammatory reaction at 90 days confirms the findings of many previous studies that polyethylene tubes can be considered as a good model for animal studies. Torneck  has shown similar fibrous tissue repair with no lasting inflammation surrounding the polyethylene tubes. After14 days observation in the new sealer group, neutrophils, lymphocytes, macrophages, and F.B.G. cells were more at the open end as compared to the sides of the tube. The fibroblastic proliferation was not seen. Lymphocytic infiltration was highly significant as compared toempty polyethylene tubes. At 30 days, inflammatory reaction was reduced and neutrophils were absent in both groups. The formation of avascular granulation tissue was not seen with the new sealer. This shows that the inflammatory response was reduced to moderate with respect to the new sealer. At 90 days, neutrophils were absent and F.B.G. cells were present only in the new sealer. The persistence of chronic inflammatory cell infiltration was noted in the new sealer and the formation of avascular granulation tissue and fibrous capsule were not seen. In our study, the foreign body giant cells were observed with the engulfed material inside the cells in 30 day and 90 day samples of the new sealer. Whereas, the foreign body response was maintained throughout the study period for new sealer. This indicates irritating components of the new sealer which should be analyzed and should be studied further to know the exact chemical reaction in the tissues. Cytotoxicity of the individual ingredients of the new sealer should be investigated to find out its chemical reaction occurring at the tissue interface resulting in persistence of inflammation. This subcutaneous implantation method is a practical method for qualitative evaluation of endodontic materials and can yield exact detailed information about tissue reaction of materials on a cellular level. Hence, animal studies are positive, efficient and valuable methods to successfully carry out research in dentistry. Methodological problems may occur during the procedure should be avoided carefully. If the material sticks along the side of the tube it should be wiped off absolutely otherwise those tubes should not be used. To overcome the problem of inability to achieve standardized material-tissue contact faced by some investigators due to use of both end open tube one should use only one end open tube by sealing the other end. Do not remove tubes from the specimens despite the difficulty in sectioning of the tube. One should cut the tissue along with the tubes in specimens to avoid removal of the most important extratubal tissue interface. To avoid deformation of the sections, the sections of specimens in the long axis of the tube should be made by using new and sharp microtome blades. Sections that may get torn due to hardness of the material should be discarded. The Department of Conservative Dentistry and Endodontics, Bharati Vidyapeeth University's Dental College and Hospital, Pune, India. The Department of Pharmacology and Central Animal house, Bharati Vidyapeeth University's Medical College, Pune. The Department of oral pathology and Microbiology, Bharati Vidyapeeth University's Dental College and Hospital, Pune. Dr. Thakkar Paresh, Director of Prime Dental, India. Dr. Deshmukh Sarojini, Professor and HOD, Department of oral pathology and Microbiology, Bharati Vidyapeeth University's Dental College and Hospital, Pune. Dr. Indurkar S.V. Professor, Department of General pathology and Microbiology, Bharati Vidyapeeth University's Dental College and Hospital, Pune. 1. Economides N, Kotsaki-Kovatsi VP, Pouulopoulos A, Kolokuris I, Rozos G, Shore R. Experimental study of the biocompatibility of four root canal sealers and their influence on the zinc and calcium content several tissues. J Endod 1995;21:122-7. 2. Bernath M, Szabo J. Tissue reaction initiated by different sealers. Int Endod J 2003;36:256-61. 3. Sousa CJ, Loyola AM, Versiani MA, Biffi JC, Oliveria RP, Pascon EA. A comparative histological evaluation of the biocompatibility of material used in apical surgery. Int Endod J 2004;37:738-48. 4. Sousa CJA, Montes CR, Pascon EA, Loyola AM, Versiani MA. Comparison of the intraosseous biocompatibility of AH Plus, EndoREZ, and Epiphany root canal sealers. J Endod 2006;32:656-62. 5. Langeland K. The histopathologic basis in endodontic treatment. Dent Clin North Am 1967;491-520. 6. Zmener O, Banegas G, Pameijer CH. Bone tissue response to a methacrylate-based endodontic sealer: A histological and histometric study. J Endod 2005;31:457-9. 7. Dag Ørstavik. Materials used for root canal obturation: Technical, biological, and clinical testing. Endod Top 2005;12:25-38. 8. Ricucci D, Laneland K. Apical limit of root canal instrumentation and obturation, part 2. A histological study Int Endod J 1998;31:394-409. 9. Bratel J, Jontel M, Dahlgren U, Bergenholtz G. Effects of root canal sealers on immunocompetent cells in vitro and in vivo. Int Endod J 1998;31:178-88. 10. Hauman CH, Love RM. Biocompatibility of dental materials used in contemporary endodontic therapy: A review. Part 2 root canal filling materials. Int Endod J 2003;36:147-60. 11. Görduysus MO, Etikan I, Gököz A. Histopathology evaluation of the tissue reactions to Endo-Fill root canal sealant and filling material in rats. J Endod 1998;24:194-6. 12. Olsson B, Sliwkowiski A, Langeland K. Subcutaneous implantation for the biological evaluation of endodontic materials. J Endod 1981;7:355-67. 13. Stanford JW. Recommended standard practices for biological evaluation of dental materials. Federation Dentaire Internationale. Int Dent J 1980;30:141-88. 14. Huang FU, Tai CH, Yang SF. Induction of interluking-6 and interlukin-8 gene expression by root canal sealers in human osteoblastic cells. J Endod 2005;31:679-83. 15. Sousa CJ, Montes CR, Pascon EA, Loyola AM, Versiani MA. Comparison of the intraosseous biocompatibility of AH Plus, Endorez, and Epiphany root canal sealers. J Endod 2006;32:656-62. 16. Cohen BI, Pagnillo MK, Musikant BL, Deutsch AS. An in vitro study of the cytotoxicity of two root canal sealers. J Endod 2000;26:228-9. 17. Mjör IA, Hensten-Pettersen A, Skogedal O. Biologic evaluation of filling materials. A comparison of results using cell culture techniques, implantation tests and pulp studies. Int Dent J 1977;27:124-9. 18. Garcia Lda F, Marques AA, RoselinoLde M, Pires-de-Souza Fde C, Consani S. Biocompatibility evaluation of epiphany/resilon root canal filling system in subcutaneous tissue of rats. J Endod 2010;36:110-4. 19. Rowe AH. Effect of root filling materials on the periapical tissues. Br Dent J 1967;7:98-102. 20. Torneck C D. Reaction of rat connective tissue to polyethylene tube implants. Part II, Oral Surg Oral Med Oral Pathol 1967;24:674-83. 21. Langeland K, Guttuso J, Langeland L, Tobon G. Methods in the study of biologic responses to endodontic materials. Oral Surg Oral Med Oral Pathol 1969;27:522-42. 22. Torneck CD. Reaction of rat connective tissue to polyethylene tube implants. Part I. Oral Surg Oral Med Oral Pathol 1966;21:387. 23. Orstavik D, Mjör IA. Histopathology and X- ray microanalysis of the subcutaneous tissue response to endodontic sealers. J Endod 1988;14:13-23. 24. Zmener O. Tissue response to a new methacrylate-based root canal sealer: Preliminary observations in the subcutaneous connective tissue of rats. J Endod 2004;30:348-51. 25. Kolokouris I, Economides N, Beltes P, Vlemmas I. In vivo comparison of the biocompatibility of two root canal sealers implanted into the subcutaneous connective tissue of rats. J Endod 1998;24:82-5.